Minnesota won its 11th straight match to cement its spot atop the Big Ten standings at 10-0 with a four-set win over Nebraska on Saturday. The loss marked the third in a row for the Huskers, which fell to Penn State on Oct. 13 and Wisconsin on Friday, both on the road. For the match, Minnesota outhit Nebraska .253 to .210 and outblocked the Huskers 8-4. Nebraska boasted a 62-56 edge in kills. Adanna Rollins notched a 20-kill, 14-dig double-double, while hitting at a .404 clip to pace the Gophers attack. Stephanie Samedy followed with 13 kills and 10 digs and Alexis Hart and Regan Pittman added nine putaways apiece. Samantha Seliger-Swenson put together a 47-assist and 13 dig double-double and was among five Gopher players with double-digit kill tallies. Mikaela Foecke downed 17 kills and added 10 digs and two aces to guide the Huskers. Jazz Sweet (13) and Lauren Stivrins (12) were not far behind. Stivrins hit at a team-best .423 clip. Lexi Sun added eight kills and 10 digs, but hit -.026 for the match (8 kills, 9 errors, 38 swings). Kenzie Maloney delivered a career high 25 digs. Nebraska served up three aces and used three blocks to limit the Minnesota offense to a .098 effort in a 25-19 Set 1 decision. Trailing 8-6, the Huskers put together a 5-0 run, including an ace by Megan Miller and two Gopher errors. Nebraska pushed ahead by six at 20-14 with a kill and a block by Callie Schwarzenbach and three kills, a block and an ace by Foecke. Minnesota cut the margin to two at 20-18, but the Huskers closed out the set on a 6-1 run, capped by a stuff by Stivrins and Sun. The set win was the first over the Huskers in Minneapolis this season. The Gophers turned the tables on the Huskers in Set 2, hitting .268 and coming through with three aces and three stuffs. Nebraska helped the Minnesota cause with three service errors and eight hitting miscues. The Gophers led for the majority of the set, leading by as many as eight at 16-8 including aces by Seliger-Swenson, Pittman and Lauren Barnes. The Huskers called timeout and scored five in a row out of the break, including three straight kills by Stivrins. Later, down 20-17, Nebraska used a 4-0 run, including three Foecke putaways, to grab a 21-20 edge. Minnesota salvaged the set, turning around a 23-22 deficit with the final three points, the last on a Nebraska hitting error. 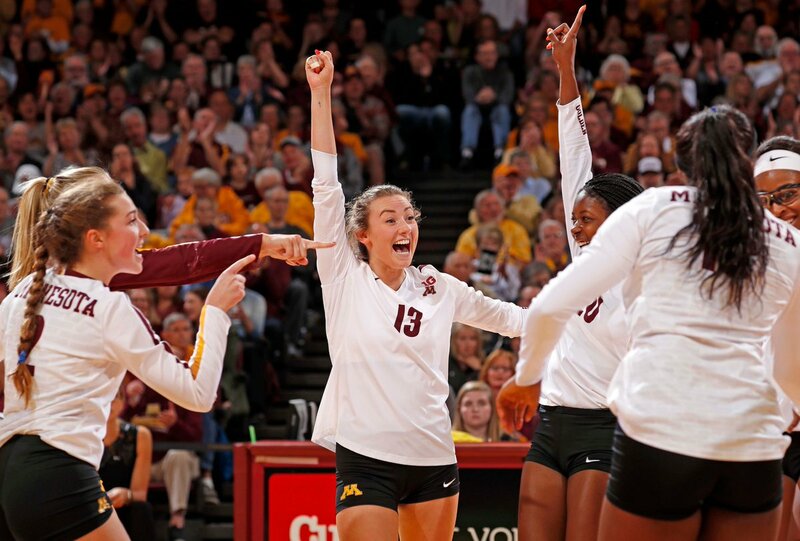 Minnesota eeked out a 25-23 win in Set 3. The Gophers boasted an early five point edge (8-3) and maintained the advantage the rest of the way, save six ties, last at 21. Kills by Rollins and Pittman gave Minnesota a set-point try at 24-22. Sweet stopped the Gophers momentarily and prompted a timeout at 24-23. Hart finished off the set, putting Minnesota in front 2-1 in the match. The teams traded points in Set 4, which saw seven early ties, last at 14. Minnesota pulled away with eight of the next 10 points, including aces by CC McGraw, Barnes and Seliger-Swenson. Nebraska called timeout and got a kill from Sun, but the Gophers closed out the night on 3-1 run. Samedy, Rollins and Pittman poured in the offense to wrap up the team’s 10th conference win.